Ever try to fall asleep and the excruciating pain from a toothache just won’t let you? The pain caused by a toothache, whether it is constant of intermittent, can affect your daily life until it is treated. What causes a toothache? 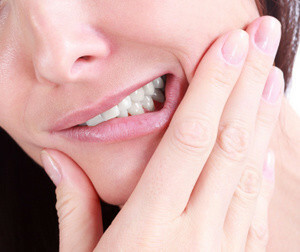 Toothaches can occur for a variety of reasons: Most of the time deep decay in a tooth has resulted in an abscess within the bone, or trauma caused a cracked tooth possibly exposing roots and nerves. Gum disease can also cause pain in the oral cavity. Sometimes the pain can be “referred”, meaning the source of the pain may be different than where it is perceived: infections in the ears and sinuses can make your mouth hurt. How can you end this misery and stop the pain? There is no magic cure out of a bottle and although antibiotics may provide temporary relief, they will not put an end to your suffering. Sometimes applying heat or cold to the area can provide welcome, but short-term relief from a toothache. Several over-the–counter medications available at the pharmacy such as pain relieving gels and numbing solution, as well as pain medication can provide temporary pause of the painful sensation. While you may feel you can handle the pain, you should seek treatment by a dental professional as soon as possible, because the cause of some toothaches can actually be life threatening. Therefore it is important to get to the root of what is causing the pain as soon as possible to provide you with relief. Dr. Grubb uses sedation tailored to his patients’ needs to keep them comfortable during treatment making many routine, in-office procedures virtually pain-free. Your pain-causing tooth may require just a simple filling, but if the tooth is significantly decayed or beyond repair, it may have to be extracted. The best way to avoid toothaches, however, is to prevent them from starting through proper oral hygiene and regular dental checkups. If it has been more than 6 months since your last dental visit, please call Dr. Grubb’s office today at 410-939-5800 to schedule your appointment.